Cook Bacon on high heat until almost crisp. Set aside. 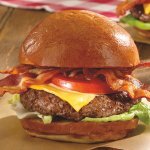 Cook Burger to order (4-5 minutes per side on high heat for Medium Rare). Add American Cheese approximately 30-60 seconds before Burger is done, and allow to melt. Use the Quick Steam method for a faster melt. 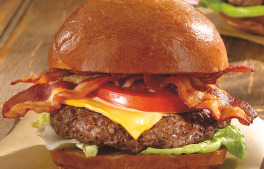 Build Your Burger: Bottom Bun, Lettuce, Burger, Tomato, Bacon, Top Bun.